Today’s house tours is a 20 sqm2 small space in Sweden with a beautiful gallery wall and a great example of how to decorate your home with art. The fact that it is, indeed a small space, makes it even more interesting. Each room is beautifully styled and there isn’t a single corner I don’t love. Proof that size really doesn’t matter and that you can create a real gem out of a small flat. Josefin Haag, the owner of this flat, used a palette of three colours throughout her flat: black, white and wood. 3 hues that you can find throughout the flat in the choice she carefully made for her picture frames, furniture and decorative objects and which gives her gallery wall and home, a nice, warm, arty feel. I find this home visually inspiring, don’t you think? Is there any details or corner in this flat that inspires you? 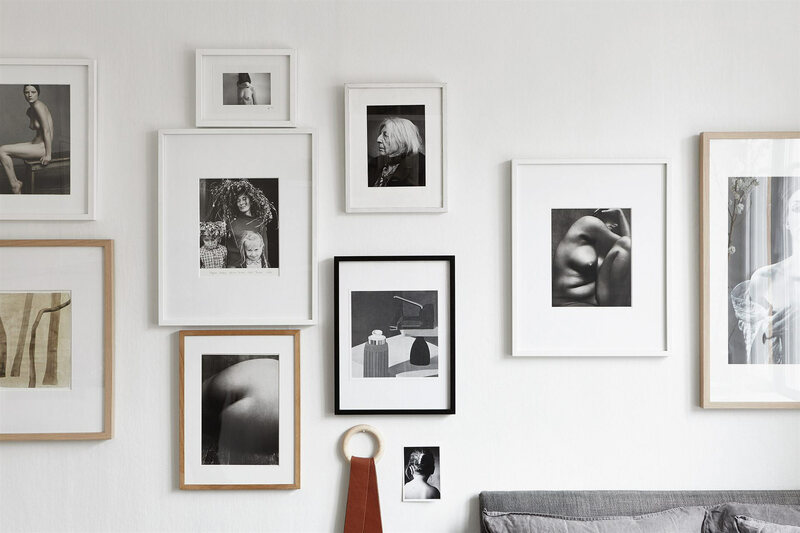 If you are after ideas on how to do a gallery wall, check this article on How to hang a gallery wall the perfect way, or this inspiring monochrome gallery wall which is my all-time favourites or my Pinterest board. Really love this post, I think the smaller details make all the difference, right down to what colour you paint your skirting boards. Particularly love the natural non-plastic utilitarian elements in the kitchen. Makes ordinary look beautiful! Really lovely apartment. Creativity at its best when the sqms are so reduced :) I love the use of the window sill as a bedside table !!! P.s. I also love your blog! So inspiring!! I am an absolute notice when it comes to interiors, but have been fumbling my way through a renovation project for the past few months! -Thanks so much for this awesome inspiration. Love it all but the grey painted doors are inspiring me ! Divine. Next Post5 things I want right now!